I've mentioned before that I usually prefer to watch movies in the comfort and privacy of my own home. However, there are exceptions: anything featuring the Minions or the Avengers. Back in 2012, Collin and I attended a fifteen-hour Marvel Movie Marathon that included Iron Man, The Incredible Hulk, Iron Man 2, Thor, Captain America and the midnight first showing of The Avengers. More recently, we saw the first showing of Captain America: The Winter Soldier at 8:00 the night before the official release date. 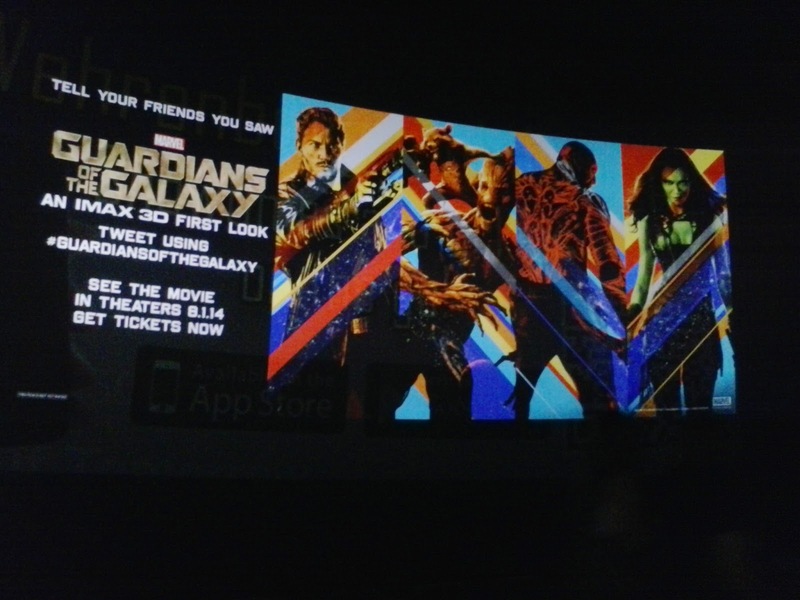 Monday night, we attended a screening of the "first look" preview of Marvel's latest release (August 1st), Guardians of the Galaxy, with a few hundred other Marvel fans and local film critics. We loved the preview--I didn't think I would like it when I first heard about it, but the more I see, well, I can't wait now! As for the rest of the evening...it could have been a movie. The title would have to be something to do with Murphy's Law. It started with Collin's discovery that our printer needed an ink cartridge. He couldn't print the email he'd received to verify that we had requested two passes to the preview. We decided to have an early dinner at a nearby Chinese place. Storms were firing up in the area, and I wondered if we'd get to the theater ahead of them. Though the screening was scheduled for 7:00, we were advised to arrive early. Very often, these events are overbooked, and even with a pass, late arrivals are turned away. We decided we'd get there between 5:00-5:30. That put us fairly close to the front of the line--which became a very long line very quickly. We spent a little over an hour in line, and were given instructions regarding anti-piracy. Phones would be allowed in the theater, and we would be permitted, even encouraged to photograph and Tweet the image on the screen. After that, all phones were to be shut off (not put on silent, SHUT OFF!). No other recording devices were permitted in the theater--no tablets, no recorders, no iPods, nothing. "If you have them with you, take them to you cars now. If anyone is caught recording, you will be arrested immediately. There is a ten-year prison sentence for piracy." Some of us were puzzled, as we'd brought tablets into the theater previously with no problem. Collin and I take ours everywhere. We had them with us that night--and since we'd taken the bus to the theater, there was no way we could take them home and come back. "We would take them out to our vehicle, but he drove away when we got off." That was what I wanted to say--but for once, I managed to keep my mouth shut. Our Kindles were already turned off, so unless the theater staff decided to search our bags, we were okay. I'm convinced Disney should be running Homeland Security. Finally, we were seated in the IMAX auditorium. As soon as I got the photo (above), I turned my phone off and put it away. That's when I heard the thunder. Someone said we were under a severe thunderstorm warning. More thunder. The man seated in front of us still had his phone on. "I've got the radar," he said, passing his phone to me. There was an angry-looking red cell right above our location on the map. Not good. "It'll be gone by the time we leave," Collin predicted. It wasn't. The lightning was sporadic and the rain fairly light, so we figured we'd make it home with no problem, even though it was about a quarter mile walk from the bus stop to our apartment. I had my cane with me, but found myself wishing I hadn't left the walker at home. The sky was ominously dark when we got off the bus. We made one stop, hoping the storm would pass by the time we started the walk to our place. It didn't. In fact, it started to rain harder. We ducked into the pizza place and bought a couple of sodas, thinking we'd wait it out there. The rain came harder. The lightning was dangerous, with strikes every few seconds. "What time does this place close?" I asked. I looked at my watch. That would give us just over an hour. The storm got worse. I suggested calling a cab. Collin didn't think we'd get one. Too close to home. The fare wouldn't be much more than $5.00. Finally, I talked him into it. He had the number in his phone, so he made the call. It was a crazy night of storming on Monday. I was babysitting McKayla and the electricity went out, but we had a grand time until the parents came home. I waited for a bit but finally decided to go home around nine and the weather did not get better. What a crazy night for you guys. I can see why you like watching movies at home. It was around 9:00 when we finally got home, too. Something ALWAYS happens to us when we go to the movies. In April, we went to see Captain America: The Winter Soldier. The film was stopped temporarily because a tornado was nearby. I'm starting to feel jinxed! In terms of the weather, that is definitely a Murphy's Law night! I'm looking forward to the film. You're going to love it! There were a lot of comments posted after the screening--it's being described as the next Star Wars. The raccoon steals the movie, though! After going through all that, I hope the movie was worth it! Promise not to laugh, Cheryl...it was a 17-minute preview of the movie coming out on August 1st! OK you saw the whole movie or just a preview ? and anyone would be better than Obama and his home land security. I am so fed up I could scream. Anyways so happy you got home all in one piece ! I don't know much about this movie but I want to see it. It was a preview...but they filled every seat and had to turn people away. I figured living near the border, you'd be fed up by now. That's what we've had here for the past few summers, Mark. Seems like every year, the number of tornadoes increases! I had to skip this post, just in case I see this movie at home, if it streams for free. The movie house is crazy expensive, so I rarely go. Ohhh, thanks for telling me. 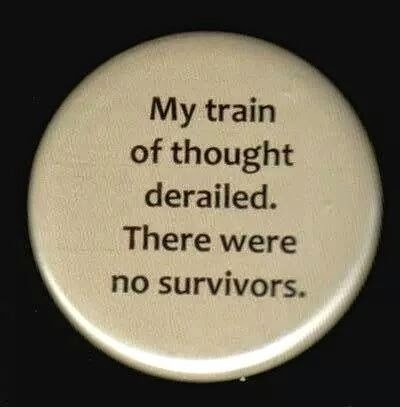 Sorry about the night though. So glad you got home before the hail! Hilary, I've never seen such tight security for a movie--let alone a movie preview! That's about the only thing that didn't go wrong, Carla! Grace, my mom and I didn't like too many of the same TV shows, but we liked most of the same movies. I'm still trying to figure that one out! Collin and I do like most of the same movies, but occasionally, we'll end up in separate auditoriums at the Cineplex. What an adventure! It just reminds me of how comfortable it really is to watch movies at home;). I did a lot of thinking about that, Maria--and still, I'm dumb enough to go back to see the whole movie on the 31st!